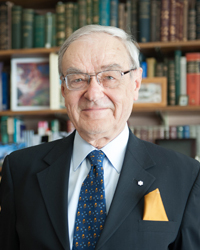 Dr. Vladimir Hachinski has changed the way the world understands stroke and dementia, and now his pioneering work in the field has earned him the Royal Society of Canada’s prestigious McLaughlin Medal which recognizes research of sustained excellence in medical science. The first at Western University to be awarded this honour, Dr. Hachinski credits his success to those around him. “There is an African proverb that says that ‘if you want to go fast, go alone, if you want to go far, go together,’” he said. “I have traveled far because of the remarkable patients, colleagues, and students with whom I work.” And travel far, he has. A Distinguished University Professor of Neurology at Schulich Medicine & Dentistry and a Lawson Health Research Institute Scientist, Dr. Hachinski also co-founded the world’s first successful acute stroke unit, now the standard of care. He discovered the brain region involved in sudden death following stroke, and helped develop the stroke-Alzheimer disease connection, paving the way for novel therapeutic approaches. Recently he and colleagues showed for the first time at a whole population level, decreased dementia incidence associated with a successful stroke strategy. The concepts of brain attack, multi-infarct dementia, leukoaraiosis, vascular cognitive impairment and the ischemic score are his own. He has been editor of STROKE, President of the World Federation of Neurology and created the World Brain Alliance, World Stroke Day and the World Stroke Agenda. Congratulations to Dr. Hachinski on this incredible achievement.